(Nanowerk Spotlight) Liquid crystal displays (LCD) have become an integral part of our everyday life. LCDs are everywhere, on your digital watches, cameras, iPods, laptop computers, television screens or car navigation displays. LCDs get their name from the special liquid crystal solution that is contained between two thin glass plates inside the display. Recent research findings suggest that embedding doped metal nanoparticles (MNP) in liquid crystal materials increases the performance of certain display devices. So far, however, the main problem with this approach has been that the inclusion of nanoparticles destabilizes the LC material. Researchers have now succeeded in synthesizing metal nanoparticle embedded stable liquid crystals in a single step, without using any external reducing and stabilizing agents. As a bottom-up strategy, this work is a further step towards synthesizing three-dimensional macro structures using small nanoparticles as building blocks, and an elegant method in fabricating soft organic architectures; particularly when it is combined with electronic, magnetic or photonic properties of inorganic materials. Most existing building block approaches are based on separate synthesis of metal nanoparticles, their surface modification and assembly in predefined structures using different kind of templates. This multi-step process often is not very efficient and may not even be feasible on an industrial scale. The major hurdles so far in embedding externally prepared metal nanoparticles into liquid crystals were the requirements for a multi-step synthesis and the lack of homogenous hybrid materials. Multi-step synthesis of metal nanoparticles not only demands laborious purification methods it also increases the cost of production which no longer can be ignored. "We developed a new approach of obtaining a metal nanoparticles assembly directly from a metal precursor where our template itself plays a role in synthesizing nanoparticles, stabilize them and assemble them in defined structures" Dr. George John explains to Nanowerk. "In this novel approach we demonstrate how to obtain the MNPs embedded in LCs based on the synthesis in situ of MNPs by using glass-forming mesogens without any external reducing and stabilizing agents." This research is a collaborative work between Professor George John’s group (Dr. Praveen Kumar Vemula, Dr. Ajay Mallia) at the Department of Chemistry, The City College of the City University of New York and Professor Pulickel Ajayan’s group (Dr. Ashavani Kumar) at Rensselaer Polytechnic Institute. This work, titled "In Situ Synthesis and Assembly of Gold Nanoparticles Embedded in Glass-Forming Liquid Crystals", was published in the March 27, 2007 online edition of Angewandte Chemie International Edition. The researchers synthesized new low-molecular-weight mesogens – a mesogen is the fundamental unit of a liquid crystal that induces structural order in the crystals – that could reduce metal salts to nanoparticles as well as form glassy LC phases. These thermotropic liquid-crystalline systems were used for synthesis in situ and spontaneous assembly of MNPs in LC phases into mesostructures. They also successfully demonstrated to some extent the ability to control shapes of nanoparticles obtained in different LC phases where self-assembled liquid crystal domains act as templates. Gold nanoparticles in different shapes such as boomerangs, elongated rods, occasional helices and spheres were synthesized depending upon the template liquid crystal phase. "Liquid crystalline phases are known to form different domains and, depending on the templated synthesis, in situ generated particles were aligned into ribbon-like morphologies" says John. "The major advantage of our approach is that we could achieve assembly of MNPs directly from metal ions without a separate synthesis of MNPs and their later derivatization" says John. "Intriguingly, our protocol does not require any external reducing and capping agents which eventually gave us ample opportunity to avoid multi step protocols and expensive separation methods." The key part of this novel approach is designing suitable amphiphilic mesogens which can display glassy liquid crystal properties and also can reduce the metal salts to their pure metal states for generating metal nanoparticles. By achieving this, synthesis, stabilization and assembly of nanoparticles becomes possible in single step; which is what the two research groups successfully demonstrated. John points out that their designed mesogens were very stable and exhibit excellent glassy LC properties at room temperature. These research results are an indication that the appropriate design of LC templates can lead to an MNP assembly of well-defined and directed three-dimensional macrostructures. "So far we are able to obtain nanoparticle-embedded stabilized liquid crystals" says John. "We are conducting further studies on the performance of MNP-embedded LCs for display application. 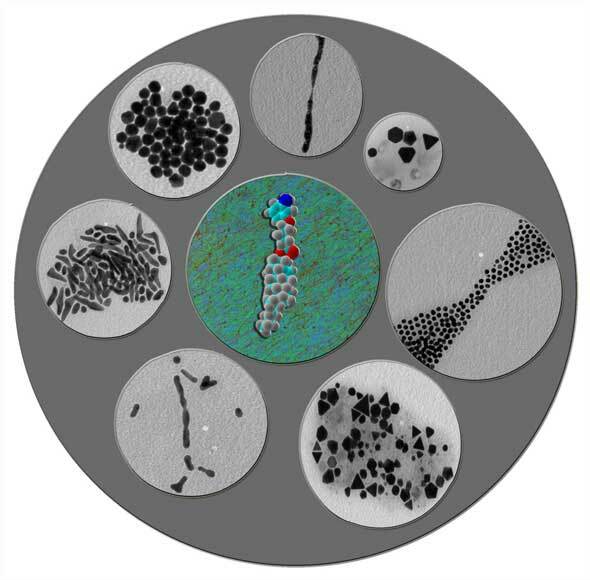 We are also looking to obtain three-dimensional MNP assemblies of desired shapes to study some fundamental aspect of their collective properties."